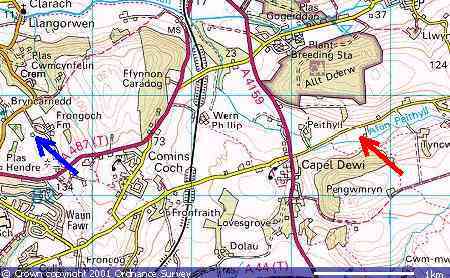 The NERC MST Radar site (52.42°N, 4.01°W; British National Grid Reference SN 637 826) is situated near Capel Dewi, 6 km to the east of Aberystwyth in West Wales, UK. Its location is indicated by the red arrow on the map above. The radar site, at 50 m above mean sea level (amsl), is within an approximately east-west aligned valley, which rises up by 100 m on the north and south sides. Since this can have a significant effect on the low-level winds, surface wind measurements are made from Frongoch farm (52.42°N, 4.05°W; British National Grid Reference SN 604 826), the location of which is indicated by the blue arrow on the map. The base of the wind tower is 140 m amsl and 3 km to the west of the radar site.